An ideal Eco Gift Set for anyone wanting a plastic-free kitchen. With 32% off the RRP! This Eco Gift Set is a great way to introduce a friend to plastic-free alternatives. 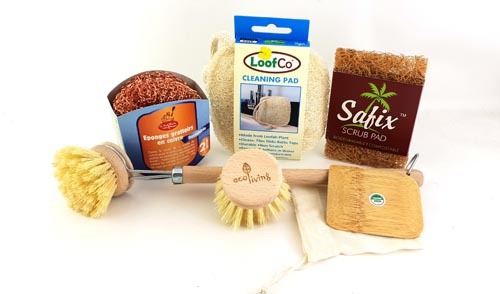 This eco gift set contains, 1 x Loofah plant cleaning pad, 2 x Copper sponges, 1 x Safix coconut fibre Pad, 1 x Wooden Dish Brush, 1 x Spare Replaceable Dish Brush Head, 1 x Organic Bamboo Pot Scraper and 1 x Organic Reusable Tea bag. An ideal Eco Gift Set for anyone wanting a plastic-free kitchen. With 32% off the RRP! This Eco Gift Set is a great way to help a friend on their zero waste journey or introduce them to plastic-free alternatives. This set does not come gift wrapped to save on packaging. This set is 100% Vegan. 1 x Loofah cleaning pad. Hand-made from layers of natural loofah plant, stitched together for extra scrubbing power. Fits neatly into the hand and when it's immersed in water it swells up and becomes a spongy, flexible yet robust pad that will not scratch. It is ideal for cleaning work surfaces, chopping boards, baths, sinks, tiles & taps. It will last for months with normal use and as it is plastic-free, when worn out it can be composted. 2 x Copper sponges. Ideal to gently wash and shine pots, pans, cookers, sinks and more. It is particularly effective to remove the toughest dirt. 1 x Organic Bamboo Pot Scraper. A great way to reduce your plastic items within your household. Environmentally friendly and zero waste alternative to commercial scrapers. 1 x Organic Reusable Tea bag. Made of GOTS-certified organic unbleached cotton. The string is long enough for using this bag with mugs or with a teapot. Made with organic cotton (natural, unbleached), which is easier to rinse and wash. Replace commercial tea bags with reusables. Reduces packaging waste and the energy and resources used to produce commercial tea bags. Most tea bags are not biodegradable and are actually made from plastic! This bag is made of GOTS-certified organic cotton and is reusable. Simply add loose tea, enjoy a fresh cuppa, then rinse or wash and enjoy again and again.